This month's upcoming piece is of the Angel of the Deep. He's an interesting figure, but I've never really gotten a chance to dive into his existing lore very much. Even though he's been punished to live at the bottom of the ocean, he remains faithful and humble. When he's commanded to retrieve the Book of Raziel, he does it despite knowing that it won't save him. This book is a recurring character, so I'm keeping it the same as it appears in the most recent Raziel painting. 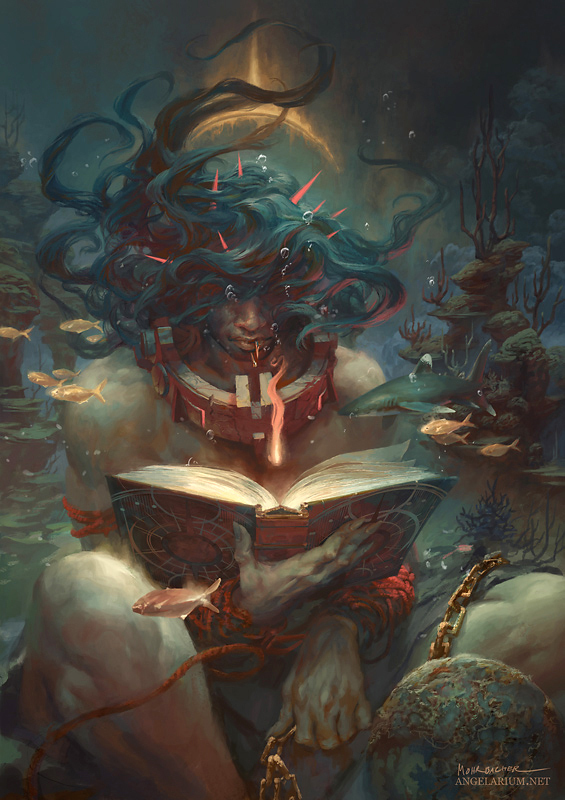 Subscribe to Angelarium on Patreon to see the latest updates about this painting. Join the community that helps support new art from this series. This month's upcoming piece is of the Angel of Dust. He's the first character I ever designed for Angelarium. This will be his 4th incarnation and the most different from the all the past versions. Each of these new Watcher paintings represents a different aspect of the same themes from their original version. Azazel is returning and this time, he seems to be missing an arm. As a central figure in the Angelarium lore, it's exciting to get a chance to bring him back with a new design.